What is the Difference Between . . . Philosophy refers to looking at life in a pragmatic manner and attempting to understand why life is as it is and the principles governing behind it… Ideology refers to a set of beliefs, doctrines that back a certain social institution or a particular organization. The source of knowledge for education is in printed materials, whereas, with experience, the knowledge is gained either through involvement or exposure. … a truth is something that is not universal, it is more subjective, and depends on the current situation. All of the above definitions are subject to debate. The distinction between “fact” and “truth,” for example is not always so clear cut in the real world. Philosophy is for Thinkers. Ideology is for Stinkers. These ideas are all basic to Dangerous Child training. They are best learned early. But independent thinking can be learned at almost any stage, if it is done in earnest. It is never too late to have a Dangerous Childhood. More: Below is the key to the graphic at the top of the page. 1) Obfuscation: Just basic confusion of one thing for another- a smoke and mirrors game. 5) Indoctrination of Education System: A left brain form of Nazis called it mastery learning. grade school, HS and university. Trivium and quadrivium education could counteract this. 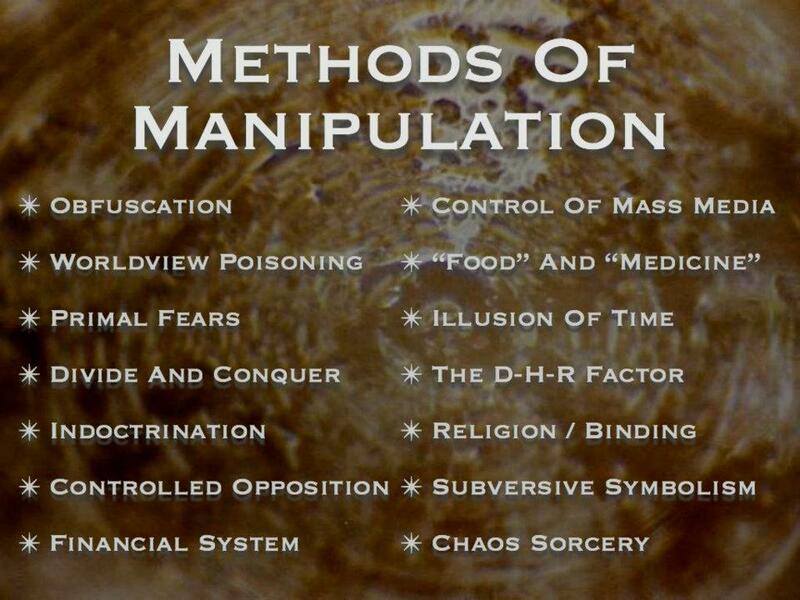 7) Monetary System of Control: Debt based fiat currency fractional reserve banking a system of illusion that we call money yet people believe in it like its a religion or god. People seem to be the most powerless to come out of. It exists purely in the mind. 8) Control of Mass Media: If you can control the info that people get to see hear and read you control their perception of reality. If you limit the scope of what they can take into their minds and awareness you limit their possibilities of solutions. Human perception management. 10) Illusion of Time: Very important for people to grasp. Play on people’s seeming inability to live in true present moment awareness– getting people to live in regret over the past or anxiety over the future. Its a fear based technique. Takes us out of true present awareness. Being fully present now to take on what is happening now. If our consciousness can be manipulated into always looking into what has happened. It takes away effectiveness of dealing with the current situation. 11) The DHR Factor: Denial, Hassle, Ridicule: What other people perceive about you. Denial, hassle ridicule factor. Things are fine the way they are I don’t want to rock the boat because I may have to deal with hassle of other people. The hassle free zone is– I don’t want all the uncomfortable aspects of life that come with standing up for truth. These are all fear based. Heightening those three forms of mental instability. Trap of inactivity and not really doing anything to make things better. 12) Religion: We need to understand these last three the best. Religion is a form of binding. To tie back Re-Ligare tying back. Forms of modern religion are mind control based on astro-theology. Giving people an exoteric version of something that was once esoteric or internal. Government is the binding on the left brain… religion is the binding of the right brain. 13) Use of Subversive Symbolism: Based on ancient sacred symbolism. Based on symbols that have been with us from antiquity. Solar symbolism, life force symbols, energy, blood, or anything we need for existence and life. They use these in modern institutions— banks, police, media, stores. We’re drenched in it. Basic symbols have a powerful psychic influence. They can speak to us without words. A wordless form of communication. Connects to occultism. This entry was posted in Ideology, Knowledge, Philosophy and tagged Doomsday has been cancelled. Bookmark the permalink. You should have been a politician, Are you ever going to break up your blog into the original 5 or 6 that you used to have or get to busy with life to keep up. You could offer the fin coin to get into your university, Just need to use the story above to get the randy young girls to write for you. Call it the virtuous circle or something. Maybe some of those young Russian women who need saving might even get a gov grant to start it. You make some very good points, thanks. Ise-goria have not visited for some time re-education camp http://www.isegoria.net/2015/04/plugged-into-the-matrix/ secretly many knows where in sh1t till neck but no one knows when will(a lot, especially in more technologically advanced world) drown! + it’s interesting if you read old magazines or newspaper from 1940 spring, how all where optimistic about what happened around and that it will not affect them……..